Puzzle game developed by Finnish studio Rovio. In Angry Birds Dream Blast the game takes place on two-dimensional boards filled with colorful air bubbles; piercing balls of the same color, we make place for the next ones and unlock useful power-ups. 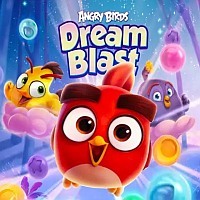 Angry Birds Dream Blast is the work of the Finnish studio Rovio. Similarly to Angry Birds Blast created earlier by this team, this is a logical game drawing on a handful of match-3 positions (although slightly different from them), the action of which is set in the universe of the title Angry Birds. Production is distributed in a free model with micropayments (free-to-play). In Angry Birds Dream Blast the game takes place on boards filled with colourful air bubbles. The game consists in piercing balls of the same colours (at least two) next to each other - in this way we make place for the next balls falling from above (which behave in accordance with the laws of physics). Although the gameplay is not difficult, it is complicated by the fact that we have a limited number of moves at each level. The struggle is diversified not only by the increasingly sophisticated shapes of the boards and various goals set for the player (such as bringing down a certain number of eggs), but also by the presence of power-ups in the form of characters in the series. While by breaking several bubbles at the same time, we unlock a Red who can remove a whole row of balls, the combination of two Reds results in a Puck that destroys the bubble in four directions; the list closes with a Bomb made from a combination of two Veils that can "clear" the whole screen. Angry Birds Dream Blast has colorful, two-dimensional graphics, maintained in cartoon style.